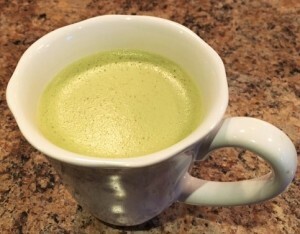 Better yet…matcha tea LATTE. Now we’re talking! With cooler weather nipping at our noses, fingertips, and toes, I am graciously welcoming the glories of roasted autumn foods and warming elixirs back into my life. I love this time of the year! Sweater and jeans donned, I savoured this beauty after a crisp walk with Dundas this morning. I upped the game of regular old matcha tea, taking it to an utterly silly level of silky-smooth lusciousness. It’s not that this lip-smacker is merely sumptuous. It’s actually really, really good for you. Let me recount the ways. ‘Matcha’ literally means ‘powdered tea.’ So while you probably already know that regular old green tea is good for you, with matcha POWDER, you are actually ingesting the pulverized leaves…thereby making it a more potent source of nutrients. It is teeming with antioxidants – such as polyphenols, which protect against heart disease and cancer, regulate blood sugar, lower blood pressure, and are…wait for it…ANTI-AGEING! A specific polyphenol found in matcha tea is EGCG, which boosts metabolism and fights inflammation. Matcha tea brings about a wonderful sense of calm while simultaneously increasing alertness.